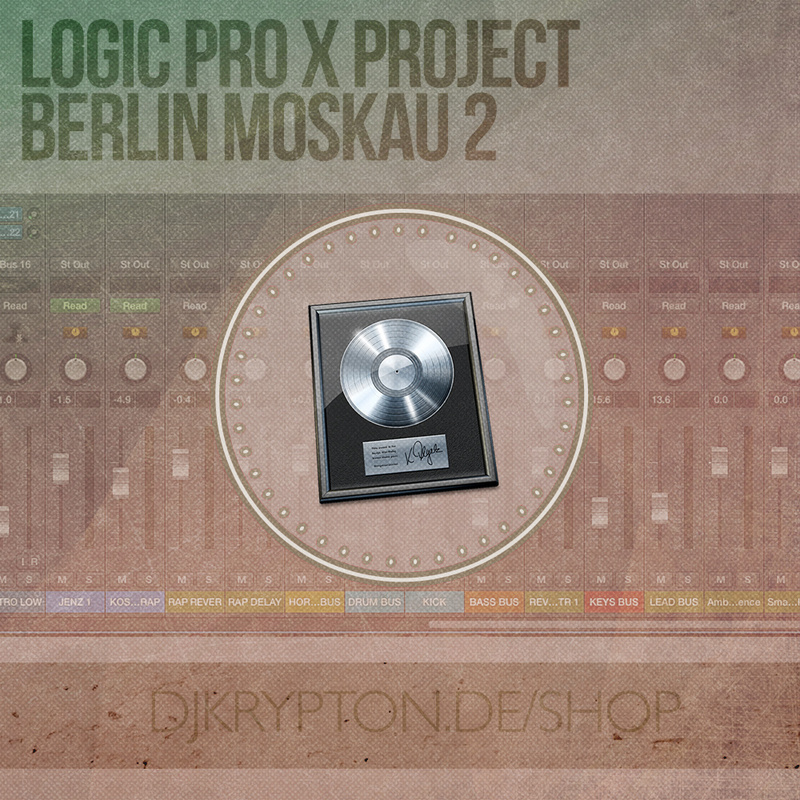 Logic Pro X Project «Berlin — Moskau 2». Файл проекта / Logic Template — DJ Krypton & Jenz Steiner — Berlin Moskau 2. В этом проекте я использовал дополнительные инструменты и фильтры Logic-a. I’ve used third party plugins in this Logic project. 1. For the Drum section I used my favorite Drum Machine Battery 4. I use this plugin nearly in all my projects. 2. The Bass sound in this project consists of two tracks. On first track I used Dune synth, and on the second one Kоntakt library Scarbee Rickenbacker Bass. 3. Rev Rhodes — is just a reverced Rhodes cords sound. 4. Rhodes P — sample I found in one of the libraries. It’s just fits good it this arragenement. 5. Organ sound I found in Vintage Organs Kontakt 5 library. 6. Pre Cords — few notes from Logic’s build in Electropiano. 7. Cords Dune — melody played on Dune Synth. 8. Cords Kontakt — same melody played with Vintage Keys Kontakt 5 library. 9. Synth Melody — second melody played with Analog Lab Synth. 10. Synth Melody 2 — second melody played with different sound with Analog Lab Synth. 10. Next four tracks is so called Horn Section. Rendered Kontakt 5 Session Horns sounds. 11. All other tracks are vocal tracks.